Private tour: Discover the medieval village of Saint Emilion and the wineries from your accommodation! Pick up of your group at your accomodation near Libourne / Saint-Emilion / Pomerol. Commented transfer to the village of Saint-Emilion. Saint-Emilion... Admittedly, you immediately think of wine but do you know that it is a medieval village with an extremely well preserved heritage... In 1999, the small town of Saint-Emilion and its surrounding vineyards have been included in the list of World Heritage sites for Humanity, as a "cultural landscape" by UNESCO. Originally, Saint Emilion is a medieval town built on a rocky promontory around a legendary hermitage linked to the history of the monk Emilion to whom the name of the town is due. The village benefited from its location on the pilgrimage route to Santiago de Compostela and many churches, monasteries and hospices were built there from the 11th century! Of course, in addition to our guided tour of the village of Saint-Emilion, I will be pleased to book for you the entrance to the underground monuments linked to the history of the village and the Saint-James way to Compostela, as pilgrims could take a break here to visit the relics of the monk : enter through the catacombs galleries and the largest monolithic church in Europe! Through the steep streets and the cobbles, let yourself travel back into the history of this city! 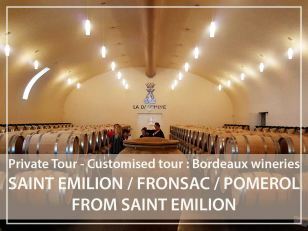 During the day, we will schedule 2 or 3 wine tastings in wineries to discover the world-famous wines from Saint-Emilion. They are renowned for their quality : come and discover the secrets of blending our grape varieties and taste our elegant wines, dominated by Merlot. Understand everything about the properties of clay-limestone "terroirs". Thanks to very strict production criterias, each vintage is unique. Entrance fees for access to underground religious monuments in Saint-Emilion : +9€/pers.